Students always hear that they should explain what they read. This is often referred to as summarizing, retelling, or recounting the text. It is important to differentiate between summarizing and analysis. Students are expected to learn how to objectively summarize text when working with Standard 2. There is a strong focus on retelling the important details, while maintaining objectivity. Standard 1, Textual Evidence, demands something different. Students are not expected to regurgitate information. The language of the standard asks students to explain the text (drawing from inferences) and to cite evidence to support analysis. Analysis and summary are very different from a summary. Standard 1 asks for analysis/. Standard 2 asks for summary. This chart helps students visualize some ways to make move beyond retelling and to remember that they have to rely on their own inferences and schema to analyze a text. 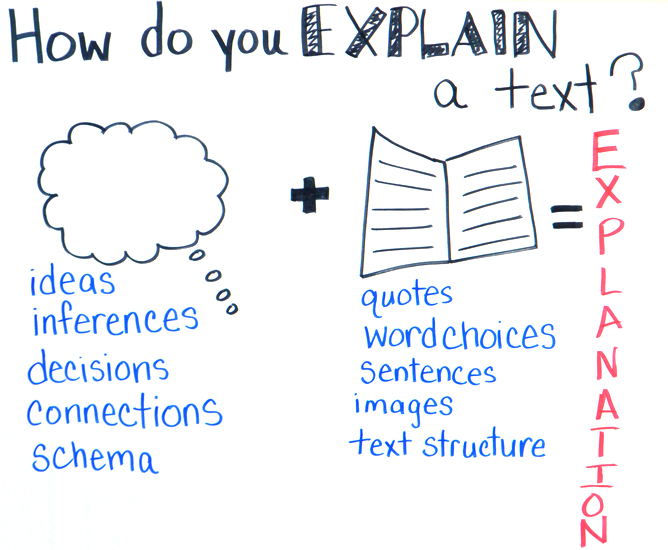 Elementary school students will use the word explain (as shown in the fourth grade anchor chart here). Note that this can be confusing for them because in standard 2, they are asked to summarize the text and explain the key details. The goal is that students recognize that explanation asks them to move beyond regurgitation of information. In grades 6-8, students will shift to the word analysis. If you use this chart with middle school students, replace the word explanation with analysis. Introduce the different ideas under the thought bubble and textbook, one at a time. Ask students to write examples of the different concepts on small sticky notes. Stick them on the chart, next to the word as a reminder of what an inference, connection, or quote is. Create individual charts for the thought bubble to simply work on inferences and the role that thinking plays in both reading and analysis. Let students create their own, small charts to keep in a notebook or writing journal. Ask them to reference it when writing their own analyses. Color code the choices and ask students to examine each other’s (or your own) writing and color code the strategies that the author relied on for analysis.